Is the trend moving in the desired direction? A graph shows the trend direction for the measure. The desired trend direction is shown above the graph. How does the nation's progress compare to the Healthy People 2020 target? Not all measures have an associated Healthy People 2020 target. When there is a target for a specific measure, it is shown by a solid blue horizontal line labeled “Healthy People 2020 target”. 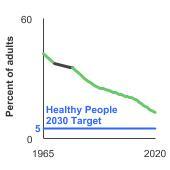 The example graph demonstrates the Adult Smoking trend, which is heading in the right direction (green line) toward the Healthy People 2020 target (solid blue horizontal line).